Trust and mistrust is one thing that has not been explicitly mentioned in the many critical pieces about the experiments that Facebook and OKCupid have done with their users, but I think it is a key aspect of this that should be addressed. When dealing with organizations, there is a degree of trust we put in them. Facebook has been eroding that trust for some time by evading it’s privacy settings. Now we find out that it is actively trying to see how effective it is at affecting people’s mood. It seems OKCupid is basically lying to you to see if it makes a difference. However you feel about their actions, I think the common response is to trust these organizations less. I make an effort to avoid engaging with Facebook as much as I can. I haven’t used OKCupid, but I used to be interested in their data analysis: now I no longer trust that analysis and I think it’s just as likely that they make up the data. I suspect others feel the same way, and that can’t be good for either of them. Furthermore, I am now distrustful of similar organizations that want to collect data on me. Two apps I downloaded recently, Happier and Unstuck, both looked appealing to me at first. However, after some thought, I stopped using them because I worried that they might misuse that data for their benefit and my detriment. I had no specific reason to believe they would misuse it, but Facebook has bred that mistrust, and that mistrust has spread. Ultimately that mistrust is bad for organizations trying to build new technology, at least in the short term. However, in the longer term, I think this is a good thing. I think that mistrust and scepticism towards organizations will lead them (at least the smarter ones) to have more respect towards their users if they even want to have any users. Without that mistrust, organizations will continue to abuse their users in any way they seen fit. That abuse has to stop. This mistrust is a step towards stopping it. 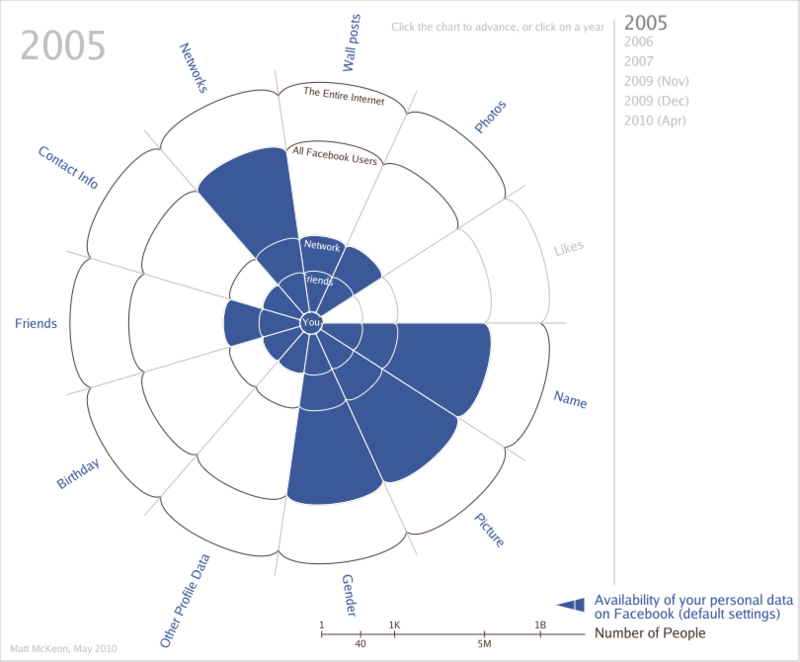 … is from a great post on how Facebook has eroded privacy settings over time and is worth a look. This entry was posted in IT and tagged Facebook, happier, OKCupid, privacy, socialmedia, trust, unstuck. Bookmark the permalink.